I ordered my wheel yesterday!!! Now, I’m not sure because no one will answer my e-mails, but I heard through the grapevine that they’re in stock, so it could come as early as this week. Time to stalk the mailman! 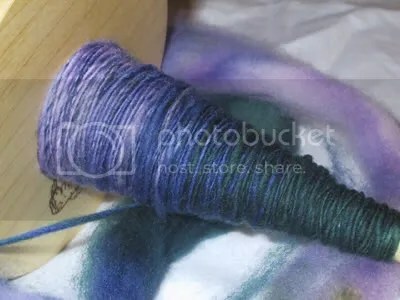 The spinning continues…as soon as I have my act together I’ll be updating the other blog with spinning progress reports for all you kickin’ generous wheel fund donors. There are some photos of finished yarn on flickr here if you care to take a peek…but don’t look if you want to be surprised! Among other things….go here for another pic with a description of my awesome haul! First things first…happy birthday to me! My gift to myself? 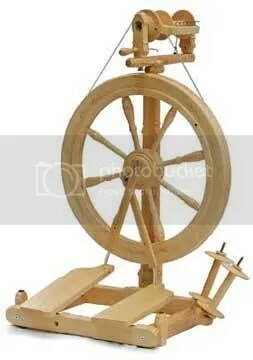 Letting my kids watch way too much television so I can spin. It’s sort of a win-win thing. Everybody’s happy. More thanks to my wheel fund donors. We’re getting close!! Squee! It’s not too late to get in on the fun! First and foremost, THANK YOU to everyone who has visited, told me I’m not crazy, linked to me, or donated to the wheel fund. I’m absolutely blown away! I’ve got a ways to go…and I have 650g of yarn to spin…but I don’t yet have that “omg, what have I gotten myself into” feeling, which is good. I’m 41% of the way to my starter wheel…or 25% if I get the level-wind flyer. We’ll see how much I can sell on eBay this week (yay for cleaning out the mystery bins) to help me along. 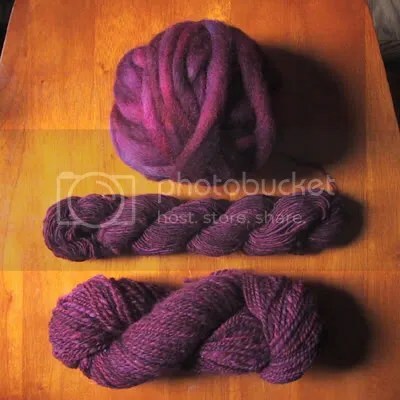 I’ve got freshly plied yarn to put in the mail to Amber tomorrow morning; there are gobs of roving for Robin either soaking, dyeing, or drying in various locations around my house; I’m stalking the mailman waiting for Cate‘s roving to come so I can start to dye it too….the list goes on. So I had this idea…. Please go and read it and then tell me if I’m nuts. Addendum: total crackup…I had a dream last night that when I checked my gmail box this morning, Jenna Adorno had sent me $220. ROFL — why Jenna Adorno? 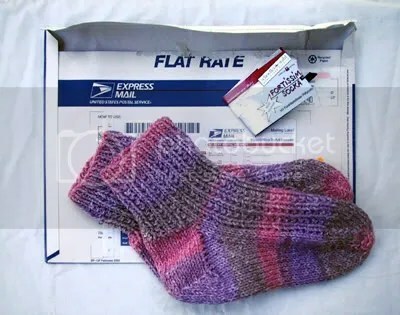 I’ve never even knit Tempting. 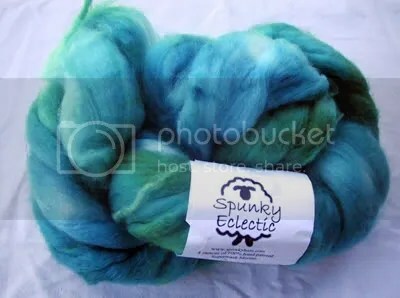 It is a great sweater though…anyway, I was all, “Jenna, I’m going to wait til I get my wheel to start on your yarn if you don’t mind, ’cause I want all 1100 grams to be consistent, you know?” LOL. Well, actually, I’m not finished yet…but you know what I mean. 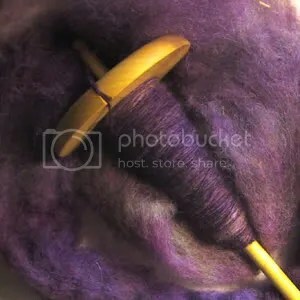 I just dyed a pound of inca cotton. Two days later, it’s still drying. Does anyone know if I can tie it up well and throw it in the dryer?? This is getting ridiculous. 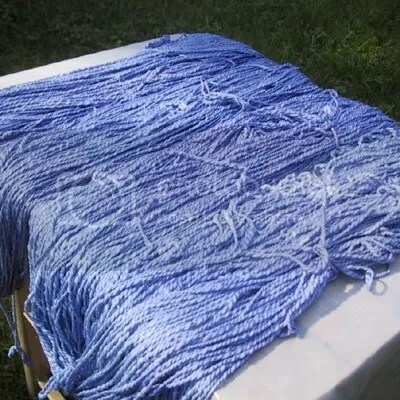 And speaking of tying it up…a word of advice…if you ever dye inca cotton, re-tie it yourself. Don’t trust the ties that are already there. My skeins are an absolute mess, and I am fearful of trying to wind them. The process was kind of skeeery (real dye, gloves, chemicals, the whole can of worms) but a good learning experience. 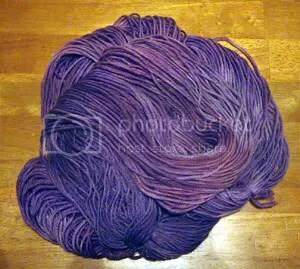 Not as purplish as I’d hoped, but no way am I going to overdye it. I don’t think I want to dye cotton again any time soon. First, Blogger has been unbelievably wonky this week. I’m lucky if I can log in, let alone post. Surprising, as it’s been very reliable for me for the past three years. Third, the original reason for this post. Lesson learned: don’t knit anything that requires this level of concentration while listening to a podcast that features the resolution of a slasher-murder-mystery, and therefore contains a ridiculous amount of screaming.